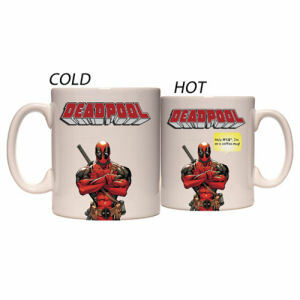 We have Just Sold out of Deadpool Im on a Mug White Mug - Previews Exclusive. Not to Worry! Fill in the Notify me When Available and you will be the first in line for our restock of Deadpool Im on a Mug White Mug - Previews Exclusive !! From the Deadpool collection by Surreal Entertainment. Deadpool Im on a Mug White Mug - Previews Exclusive. Word balloon appears when mug has hot liquid in it. Hand wash only. Not dishwasher safe. Do not microwave. Surreal Entertainment Deadpool Coffee Mugs shipping from Canada. No Surprise Border fees or Customs!